Aug 9 , 2006 – Mystique — Fascination, Attitude, Mystery are the perfect words to describe the identity of Cooler Master¡¦s new chassis series. The excitement and sense of achievement PC Modders sought after can all be found in this all-in-one package of elegance and sophistication. The notion of simplicity and versatility presents vast opportunity for you to expand you imagination. We emphasize on the attention to details and materials to accomplish a visual satisfaction and deliver sensational experience. Succeeding by Mystique 631, Cooler Master presents to you Mystique 632 which is simple and pleasing to the eyes. Not for the first time, Cooler Master enjoys its high reputation for the excellent industrial design. Our stylish product not only provides the superior functions but also persists in the aesthetic design. Instead of being bulky, the aluminum alloy design greatly reduces the weigh of Mystique 632. The sliding door mechanism inspires a pleasant feeling when using it. When you open and close the door, Mystique 632 is always in harmony with the surroundings; moreover it keeps the facility of non-door chassis. Mystique 632 stays true to your senses with its finest touch and beautiful outline. With the meshed front panel and washable air filter, Mystique 632 provides the superior airflow and maximum cooling performance. 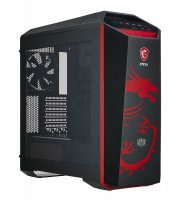 In addition, 120mm front and rear fan achieves the best ventilation. The tool-free design is so convenient for maintaining and upgrading your system. On the power supply bracket, Mystique 632 incorporates a special installation design for liquid cooling system. Through the screw-less design, users enjoys easy accessibility.